A favorite story designed to introduce graduate students to research methodology, design, and statistics features a train of commuters going into Chicago from the suburbs. One gentleman noticed that another commuter always sat by an open window. As he read he would tear small pieces off of his paper and throw them out the window of the train. After many weeks observing this peculiar behavior, the observer finally approached the person in question. “I have watched you tear off small pieces of paper and throw them out of the window for a long time now, and I am eaten up with curiosity. Exactly why are you doing this?” the observer asked. “It keeps the elephants off of the tracks” he replied immediately. “But there have not been any elephants on the tracks” the observer stated. The parallels from this story to research on global warming and their related carbon demons is uncanny. At the risk of explaining that which may need no explanation, the parallels should be identified for those without a scientific, statistical, or research background. The first parallel is between elephants on the tracks and global warming. Both are greatly feared, and should be avoided at all costs. These, in a research scheme, are also the outcome measures, the events that really matter, and in the final analysis define the success of any experiment. They must be there in the beginning, and they must be absent, or improved in the end. So, elephants on the tracks and global warming are to be avoided through experimental manipulation. They would surely produce a hitch in our get-a-longs when they occur. The second parallel is what we plan to do to avoid, delay, minimize, or prevent the above outcomes from happening. This step defines the experimental variables we plan to use to influence the outcome, global warming, or elephants on the tracks. These experimental variables are also called the independent variables, the ones that we will manipulate in order to achieve our goals. So the commuter uses small pieces of paper distributed randomly along the tracks to scare away the elephants. The global warming alarmist uses limiting carbon emissions as a way to control global warming. Both of these experiments must be conducted to determine whether either actually works, and whether, or not, either is significant in managing the outcome (elephants or global warming). The third parallel is the measurement of a final outcome after the experiments are conducted. Our commuters are worlds apart about the experiment. The observer states that there have not been any elephants on the tracks. In a research design, it is not possible to prevent something that has never happened in the past. To declare such an experiment a success is delusional, not scientific. The paper distributor has already conducted his experiment in his mind, and knows that paper works wonders. He explains perfectly why elephants have not been seen on the train tracks. As for our global warming alarmists, they, too, have already discovered the key to global warming. The key is carbon, carbon demons, which mankind spews into the environment exactly like pieces of paper along the railroad tracks. By controlling the carbon demons they say, we can control the earth’s rising temperature. To date, any evidence of significant global warming has not been measured, much like the elephants that never appeared on the tracks in the first place. In a research scheme, global warming is not a current or well measured phenomenon (an elephant on the tracks), but the alleged consensus believes it has seen an elephant on the global warming tracks. Global warming in the consensus is a prediction of things to come, a prediction of the future. It is based upon a short-term trend line which is probably unreliable. Then this unreliable trend-line is multiplied many times over until a catastrophe is predicted. It is the predicted catastrophe that is to be avoided at some time dozens or hundreds of years in the future. Until significant global warming occurs and is measured reliably now, it is exactly like the elephant, which was never there in the first place. As warming is a prediction that the earth will get warmer, success could be claimed if the experiment shows that the earth got no warmer after some period of time. For example, under Obama’s plan in 2025 if the earth is no warmer than it is now, the experiment would be considered a complete success. When global warming is not clearly measured in the beginning, the same measurement 25, 50, or 500 years in the future is called a failed experiment. When nothing changes, nothing has been proven. Every suggestion is that the earth’s temperature has been declining, not raising, for the past eleven years. Obama’s Research Plan: Because Obama says that energy independence is a national security issue, his 2006 proposal is to subsidize the production of ethanol, a renewable fuel without a carbon emission in the burning stage. His stated goal is to produce 65 billion barrels of ethanol every year by the year 2025. To do this from corn would require that three times the 2006 corn crop would be converted to fuel production, and removed as food from the stores. Land would need to be taken from wheat, soy beans, vegetables, and other edible crops to produce this additional corn for gasoline. Forget the starving Africans, and the sky rocketing cost of food! Even if this were possible, the research question would still remain: Did ethanol production prevent or reduce global warming? Come 2025, it would simply be necessary to measure the warmth of the earth. Viola! Four plus terms of presidents later, it is discovered that the earth, indeed, has not warmed an iota. It is exactly the same temperature it was back in 2006 when Obama made this his energy goal. The elephant has been kept off the tracks, and life on earth has not yet perished. And it only cost the citizens of the world 30 trillion dollars. What a bargain! It is statistically likely that we would have the exact same result without spending the 30 trillion dollars in carbon taxes, because warming was not been established in the beginning. If not from carbon taxes, where will the politicians find the play money they need to make themselves feel good and in control? Rather than to conduct a legitimate experiment, wouldn’t it be a lot easier to ignore global warming all together, and simply go straight for the throat, the carbon demons. It would be just like Obama and his Energy Czar, Carol Browner, to declare carbon a pollutant, and outlaw its emission from coal, from oil, from cars, from cows and elephants, and from breathing humans. As cows are reported by some to be responsible for up to 25% of the planet’s carbon emissions, it has been proposes that a $175 carbon tax be levied upon each cow. The farmers would need to raise the cost of beef, and the price of hamburger would increase dramatically, but Congress would have a new revenue stream, a new consumption tax in the name of carbon. It is precisely this kind of insanity that runs wild among environmentalists. Obama’s backup plan: Put more air in your tires. Ride a bicycle to work. Want to keep warm? Rub your hands together. By 2025 our politicians in Washington will be fretting about global cooling, and will be subsidizing coal production to put a carbon blanket around the earth in order to keep the human race from freezing in hell. 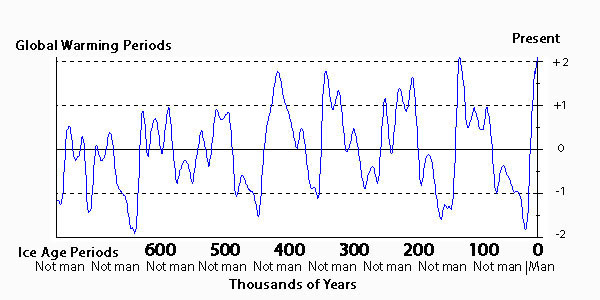 The above chart plots the atmospheric levels of CO2 in parts per million for the past 600 million years (the black line). During this same time period the earth’s average global temperature variation is plotted along the right margin. One should note the virtual absence of correspondence between the two lines. One should also note the huge decrease in atmospheric carbon to the present, characterized by some as representing carbon depletion at present. A message for environmentalists is that more atmospheric carbon is produced by natural wetlands than through all other sources combined. If one wished to control world-wide carbon, one remedy would be to systematically reduce the earth’s wetlands. But this, too, is a sacred cow for environmentalists. All the world’s revered creatures depend upon the wetlands to survive. Fortunately the expansion of culture and civilization is automatically removing wetlands. For shame! Hello! Is anybody out there with a brain? Washington is not the solution. Washington is the problem.